Our shuttle service is perfect if you're planning on finishing somewhere other than where you started, such as the Frozen Ocean Loop, or you've had some wobbly pops floating down the river and need to get back to your campsite. We strongly recommend making a reservation with us in advance-- this is not an on-demand service and isn't always available. Does the price include drop-off and pick-up? No, our shuttle prices are 'one-way'. 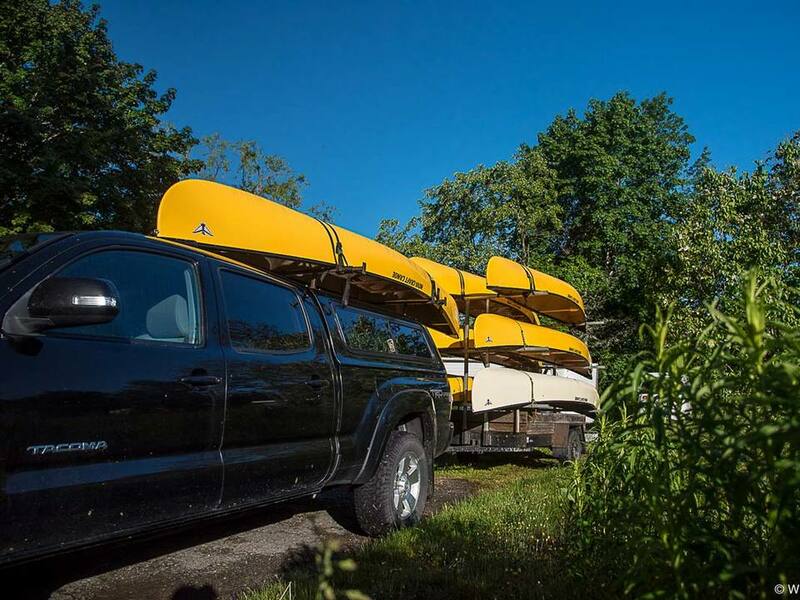 For example, if you and your group want to have the boats dropped off at the Big Dam parking lot for your weekend canoe trip and then have them picked up again afterwards, this would require two separate shuttles. If my shuttle is reserved for 12pm, is that when it leave's Jake's Landing? If you have a 12pm shuttle booked, it will leave Jake's Landing within a few minutes after 12pm and arrive at your destination sometime thereafter. This is true for both pick-ups and drop-offs. For example, if you have a shuttle reserved for 12pm for a pick-up at Eel Weir, this means our shuttle vehicle will depart Jake's Landing for roughly 12pm and arrive at Eel Weir for about 1230pm. Do the shuttle's depart on a regular schedule? No, our shuttles are by advance reservation only. They can be reserved on the hour, or half-hour. Our schedule allows for you and your group to be up to 15min late. We will do our best to accommodate, however please be prepared to be bumped to the next available slot. We'll do our best to accommodate, but it really depends on whether we have a shuttle driver available and whether there are any other shuttle reservations ahead of yours. If you foresee being early, or late, please call us with as much advance notice and we'll help you adjust your reservation. Is it best to reserve the shuttle to be before or after my trip? It is best if you schedule your shuttle at the 'top' of your trip. This way you are able to make your route decisions on your final day without being influenced by a scheduled-pick up. This mitigates the temptation to take risks to make the appointment in time. It is also much easier to calculate when you'll arrive at Jake's Landing if you're leaving Halifax at 1pm, rather than what time you'll arrive at Jake's Landing if you're leaving site 30 at... well, what ever time you leave your campsite after you've had coffee and brekkie and struck camp and picked which portages you're tackling based on which way the wind happens to be blowing that day.... you get the point? How many people does the shuttle price cover? Our shuttle prices include 0-4 persons (max capacity of our vehicles). Won't it be expensive if I have a large group and your vehicle can only take four at a time? Yes. If you are a group of 12, and require everyone to be shuttled from A to B, this will require three trips by our shuttle vehicle, which means 3x the posted shuttle rate. We recommend dropping your group off at your trip start location, then driving one or two folks back to Jake's Landing where you'll stash a vehicle or two, and then get a single shuttle back to the rest of your group and trip start location. How many boats does the shuttle price cover? Our shuttle prices include 0-4 boats (capacity of our trailer). Is it mandatory to physically check-in at Jake's Landing for all shuttles? Please note, the moment the gear is dropped off at its destination it becomes your responsibility whether you are there or not. Is it mandatory to check-in at Jake's Landing for Liberty Lake Shuttles? Yes. If you are starting at Big Dam, then you will be leaving your vehicle at Eel Weir, so just swing by Jake's Landing to let us know you're on your way and our shuttle driver will follow you down. OR, if you are starting at Eel Weir, call us from the Visitor Reception Centre when you're picking up your backcountry permits, and we'll dispatch our shuttle driver to rendezvous with you at the Big Dam parking lot, where you'll be leaving your vehicle. Is my pet allowed in the shuttle vehicle? All four-legged compadres aka fur babies, ride in the back (under a canopy, carpeted) just like our two dogs. What if I'm super cheap or have a tight budget? Dude, I get it. We used to dirt-bag it as best we could. Now I'm a dirt-bag in more of a hygienic sense and less of a lifestyle sense. We have foam shuttle blocks which will protect your vehicle while transporting a boat. These are free to borrow for the duration of your trip, so long as we have them in the inventory. They also include straps to secure the boat to your vehicle. Wait, what? Are you serious? Yes, seatbelts are mandatory as per company policy and law in Nova Scotia since 1985.